It been awhile since i last posted an actual blog post and not some of my wallpapers. the other night i made an interesting meal… i love saute’d mushrooms but i was trying to think what i could add to the dish to add some different flavors. so i went browsing around in my fridge and came across some smoked sausage… i don’t remember the brand name of it i had just grabbed what was on sale. 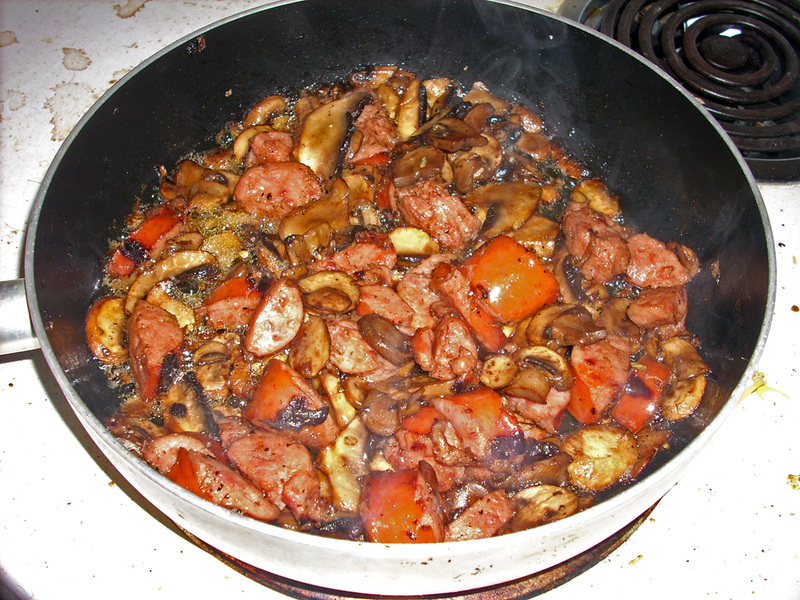 so i thought to my self … that this might be good .. so i grabbed the smoke sausage and preheated my frying pan and sliced the sausage in halves and cooked it up for about 10 mins then removed from the heat then i grabbed my second skillet and through in some butter and the mushrooms i bought a package of fresh sliced baby portabello mushrooms (i like the flavor of the porabello the best, but I’m sure any type would work) and started to saute the mushrooms as they were beginning to the cook i sliced up the sausage abit now i didn’t originally cook the sausage all the way through because i wanted to cook it the rest of the way with the mushrooms. after getting all the sausage sliced i threw it into with mushrooms added some salt and pepper although not too much because the sausage is going to add that to the dish then i through in some minced onion and just let it cook and stirred it often until the sausage was cooked and the mushrooms were tender and is was sure delicious! Good to see you posting again, I love a man that can cook! i dunno if id call it cooking persay ;) its closer to experimentation that just happens to be with food and 9 out of 10 times its a success. haha! Wow! I can’t believe I did not see this post earlier. It looks sooo good. Hehe.